home Editorial, Movies The Devolution of Hollywood? Broadly speaking, films tend to reflect the culture that produces them. For example, horror movies when looked at from a distance, plays on our cultural fears. George Romero’s ‘Night of the Living Dead,’ while outwardly appearing as a zombie survivalist movie, took America’s fear of nuclear war and took it to a next step. More recent films, such as ‘Untraceable,’ play with our culture’s technology fetish and the broader detachment of personal accountability that being an anonymous Internet watcher brings. And what about that Internet? Well, it’s changing things, too. In fact, Hollywood is starting to dip its toes in the sea of change that the past few years’ enhancements have brought about. But before we get into that, let’s talk about what’s changed on our, the audience’s, end. There was a time that movie making was a seemingly unattainable hobby. Between the costs and the availability of all the equipment needed to produce a film, Hollywood had a nice little racket going on for a while. If you wanted to make a movie, the “easiest” thing you could do was write a script. There was a large gap between film production and the audience. But with the technological advances of the past few years, that one-sided power has shifted. The first obvious leap for the audience was the advances in home movies. The handheld camera has been around long enough now that it can be found in almost every home. It has become more compact and more affordable and, for what you pay for, it provides a decent picture. Suddenly, what could have cost thousands of dollars is now a few hundred and fits in the palm of your hand. The audience had found an affordable way to film. The second shift in power came in the form of YouTube. Started in 2005 by Steve Chen and Chad Hurley, the site was created as a video sharing medium and exploded in popularity. As the site cracked down on illegal downloads of copyrighted material (television shows, movies), YouTube presented an opportunity for “amateurs” to present their work to the world for free (especially after it was discovered that LonelyGirl15 was a produced show and not a real video blog). This new distribution method provided part of the shift of power for the audience. The other seismic shift came with this little thing called an Apple. As Apple, Inc. regained footing in the consumer world with the iPod, it became clear that Apple was poised to take back some control over the home computing market from PCs, which had been dominating. Playing off of its strengths as a multi-media medium and its sudden “street cred” with the iPod, the Mac has almost become the standard home computer. And part of its appeal is that, with a standard purchase, the buyer received the iLife package which includes software to edit and score movies. So, with a handheld camera, a Mac and YouTube (and its almost inevitable ilk), a lot of the cards Hollywood was holding suddenly lost their value as the seemingly unattainable became overtly attainable. So what happened? The Internet was flooded with movies, some crappy some good. But most importantly, there were a lot of them. That gap that existed between film production and the audience diminished greatly as the audience raised the bar. While most of what was online wasn’t close to comparable to a Hollywood film, it became clear that there were standout talents amongst the rough. 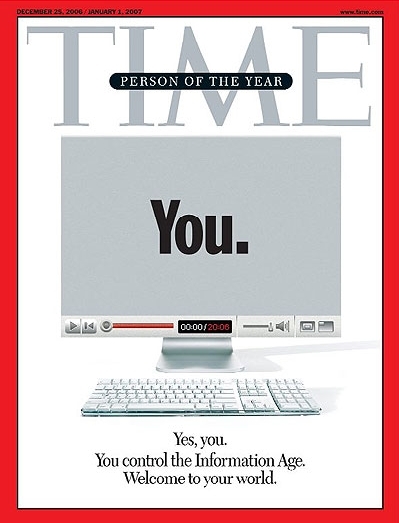 And as YouTube gained more fame and attention (thanks in large part to YouTube, Time magazine named “You” as their 2006 Person of the Year), our attention inevitably turned to ourselves as we began watching our own movies. The draw of the audience making movies was partially due to the mere excitement of watch what we created being broadcast. But the accessibility, the original content and the new faces all played a large role in drawing our attention from the theater screen to the computer screen. Other aspects obviously played a role in the box office slump (DVDs, unoriginal content, piracy [to a lesser extent] and others), but clearly our culture was shifting towards something new. Now Hollywood isn’t a complete dinosaur, locked in its ways. While it has become so large an industry that it isn’t as nimble as it used to be, Hollywood is starting to dabble in incorporating these cultural changes. The obvious adaptation comes in the form of viral marketing. Lonely Reviewer has spent a fair amount of time discussing viral marketing and its effects, so I won’t go into too much detail here. Suffice it to say that audience interaction through the Internet in marketing a film has caught on and will probably continue to do so. But another aspect of this is starting to appear in the films themselves. The biggest example, of course, is this year’s ‘Cloverfield.’ Filmed as though it were pieced together from a home video, ‘Cloverfield’ used the audience’s embracing of “lower quality” filmmaking to deliver its monster movie. The film’s hype lied behind it’s coyness in showing the monster ahead of time, the viral marketing campaign, its strategic decision not to use “name” actors and its use of the home video technique. Another recent film that pretended to utilize the YouTube approach to production was none other than George Romero with ‘Diary of the Dead.’ A reboot of his original series, ‘Diary’ follows film students who are creating a film with all of the technology just discussed, filmed in the handheld production way. While ‘Diary of the Dead’ was not a mainstream film, ‘Cloverfield’ was. And if Hollywood continues to reflect our culture and embrace this form of filmmaking, will Hollywood as we know it be able to sustain itself? Obviously big budget pictures aren’t going away any time soon, but as time progresses and Hollywood jumps on board with “lowering” its bar to bridge the gap between itself and what the audience wants, there would theoretically be an equilibrium point where Hollywood is producing films the same way the audience is, so why have a Hollywood system? And what would that mean for film? Great post about what is perhaps the greatest change to occur in any media ever. Funny you should mention Cloverfield as I recently made a post about the democratization of media on my own blog (www.tbenjaminlarsen.com).